Fantastic villa located in a very quiet area very close to the sea with magnificent views to the sea and the mountain. Completely renovated and developed to a high standard over the last 10 years by the current owners. The villa is distributed on two levels connected by an internal staircase and also separate independent entrances, perfect for having guests over. The main part of the house is located on the upper level and includes a fully equipped kitchen, lounge, laundry room, a lovely closedin naya with dining area, a large master bedroom with en suite shower room, guest bedroom and further bathroom with jacuzzi and shower.On the lower level is the guest apartment comprising a lounge with kitchen area, two single bedrooms, one double bedroom and a large bathroom with separate shower. 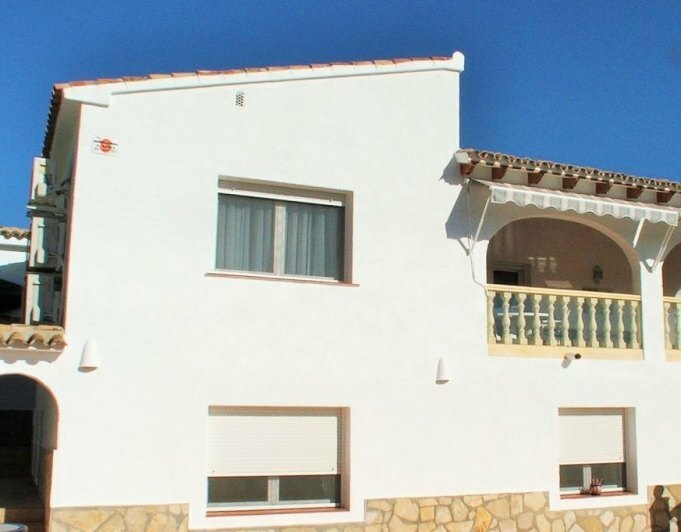 Outside there is lots of space with several terraces and a large 10x5m pool with magnificent sea and mountain views to enjoy the 320 days of sunshine a year the Costa Blanca has to offer. This small development of 4 new build properties is being built within one of the most well known areas of Moraira, Cap Blanc, with Access to a Little beach approximately 800m from the properties and close to all amenities.Each property will benefit of 3 bedrooms, 3 bathrooms, open plan living/kitchen, ducted airconditioning hot and cold, security glazing, private 8 x 4 pool and off road parking.18A: Is being built on a totally flat plot of 432m2 with a total built size of 393m2 including pool, terraces and basement. This property due to it's corner position will benefit from sea views from the first floor and the roof terrace, it will benefit of a carport. 535.000 €18B: Is being built on a plot of 393m2 with a total built size of 349m2 including pool, terraces and basement. It will benefit from a carport. Total price 495.000€.20A: Is being built on a plot of 452.23m2 with a total built size of 403.25m2 including pool, terraces and basement, It will benefit from a car port. Total price 535.000€.20B: Is being built on a plot of 415.67m2 with a total built size of 423.74m2 including, pool, terraces and basement. In this case it will also benefit from a enclosed garage. Total price 565.000€. 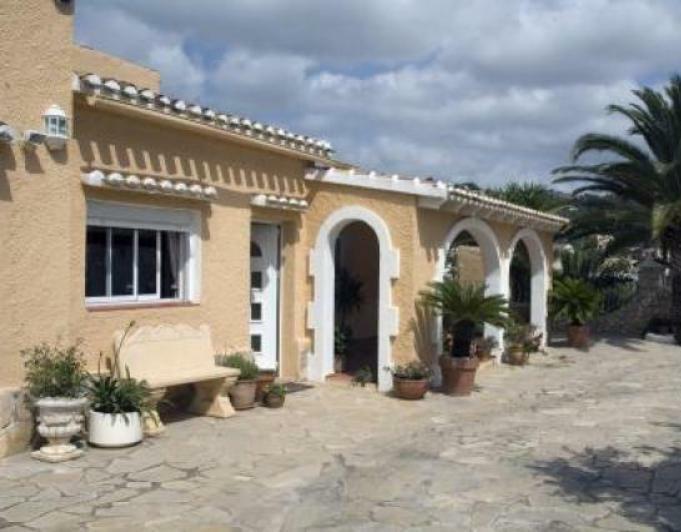 Large villa in the sought after area of cometa Moraira for saleLocation!Location!Location! 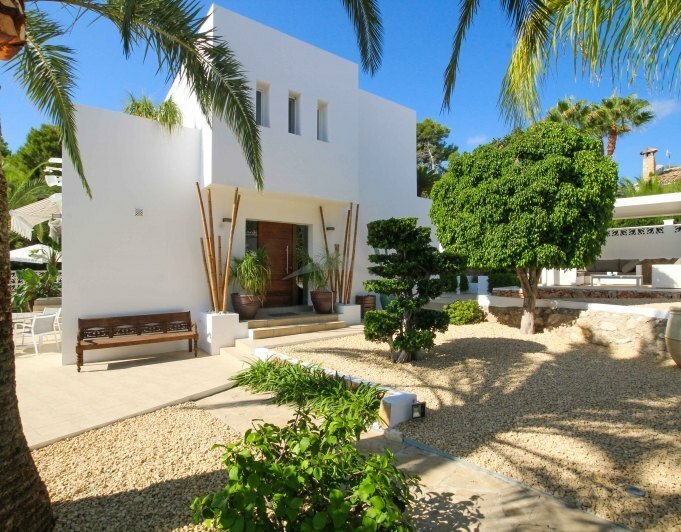 This is a large seven bedroom villa within a 15 min walk to Moraira and the beach. Set in a peaceful and private Cul de sac accessed via automated garden gates which gives way to a large driveway. The principal entrance is found to the side elevation of the property. Entering the property leads into a large Lounge/Dining room and open plan kitchen.The ground floor consists of four double bedrooms, one of which leads out to the garden area via sliding patio doors. There is also a shower room and bathroom.Leading up to the second floor there is a second lounge and kitchen, three double bedrooms, bathroom and a shower room. There is a large summer which accommodates stairs leading up to a roof terrace. Here we have sea views.Outside there is a 8m x 4m Swimming pool, landscaped garden and a large games room and BBQ area. Benefits of this property. Peaceful location.Easy walking distance into Moraira and also the beach.Flat fenced plot.Large seven bedroomed villa that could be made into a B&B (subject to planning)8m x 4m poolStorage, built in wardrobes.Airconditioning and ceiling fans.Roof terrace with sea views.Gas central heating.Separate entrances to the upper floor and ground floor. 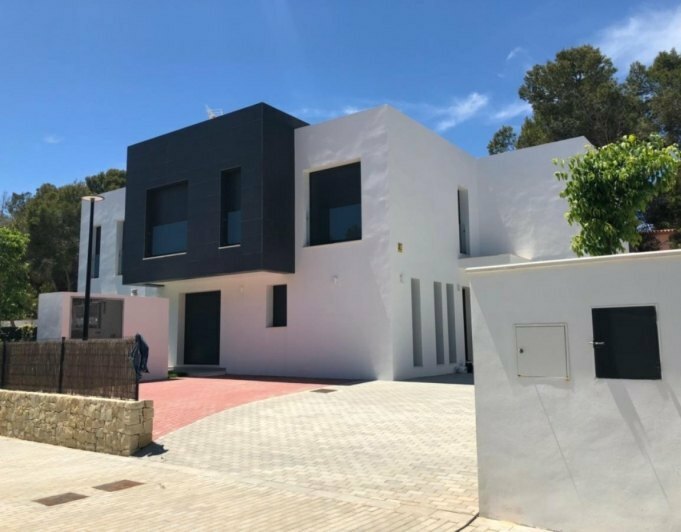 This is good for rental purposes.Internal stairs.Double glazing.Plot 800m2Build size 271.90m2 This is a good opportunity to buy a large villa next to Moraira village. 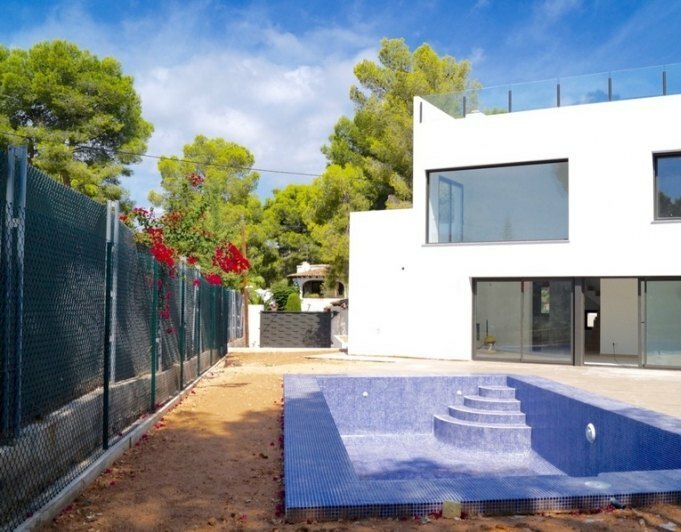 If you are looking for a design house in the beautiful town of Moraira, this is your chance.These beautiful houses are built with the help of the best architects and materials. In a quiet area of Moraira. But you will have in your hand everything you need: beach, shopping, , restaurants, party, quiet…This house has a living area of 179 square meters. It will have a wonderful garden with private pool. Each house has its private parking spaces.Each of these luxury homes have two habitable floors. The ground floor consists of a large living room with the spacious and modern kitchen, and a bathroom.Upstairs there are three bedrooms and two bathrooms with high quality.So, ir you are looking for a quiet, design, exclusive and elegant house, residencial PINO BLANCO is what you are looking for. Luxurious villa of 300m2 built in 2001, fully equipped and is laid out on two levels. The main living area comprises of a large entrance hall, living room with open fireplace, beautiful kitchen with breakfast bar opening onto the dining area with a totally glazed, southfacing wall giving fantastic views over the valley and to the sea. The master bedroom has a dressing room and ensuite shower room with double basins, there is a second double bedroom and a large bathroom. Downstairs has a double patio door leading in to a living/dining room with American kitchen; the third double bedroom has ensuite shower room and patio doors leading out to the pool terrace. There is a fourth double bedroom, and large storage area suitable for conversion.The plot of 850m² is entered through an automatic gate with a paved driveway leading to a garage with automatic door and roof terrace above. The beautiful garden is laid out with grass, Mediterranean plants and palm trees, with an automatic irrigation system and exterior lighting. The pool has Roman steps, a shallow beach entrance of natural stone and a waterfall, with an outside shower. The villa is fitted with an alarm, tilt und turn windows with security glass, mosquito netting and roller blinds, airconditioning in the master bedroom, under floor central heating, satellite television and wiring for BundO stereo equipment. The interior walls are smooth and the upstairs is done out in a lemon/ochre sponged paint effect. 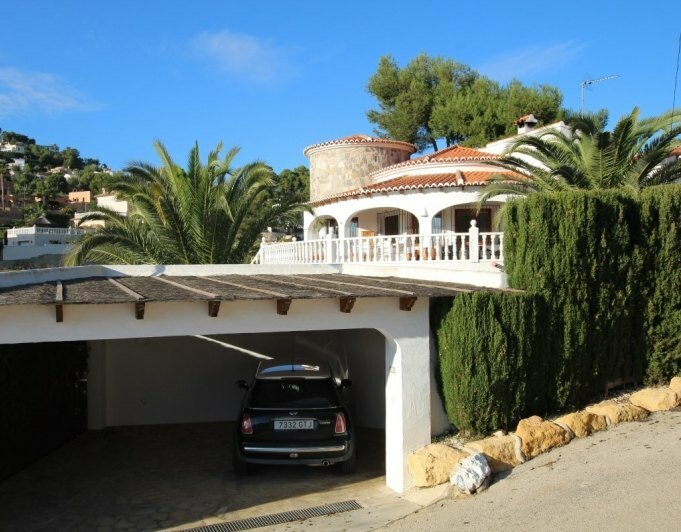 This superb villa is set within a 1160m2 flat plot in the area of Paichi, only a short distance to the heart of Moraira. From its slightly elevated position the villa benefits of absolutely breathtaking sea views from the bay of Moraira till Altea and the mountains.The access to the plot is via the double iron gates which lead through a long private driveway to the ample parking and the double garage, from here a flight of stairs lead to the ample terrace and porche area off the living room, a set of glass doors give access to the large living room with big windows overlooking the sea, to the right we have a formal dining room and straight ahead we have a semiopen plan modern kitchen, from here through the hall way we find a fully equipped family bathroom, an ample office and single bedroom. From the office an internal staircase lead to further 2 bedrooms and additional shower room.From the dining room a separate internal staircase lead up to the big master suite with dressing area, ensuite bathroom and big private terrace with even better views.On the lower level we find a big rectangular pool with fountain features, round jacuzzi, big sunbathing terrace, summer kitchen/BBQ area and a self contained apartment which comprises a spacious living room (bedroom), bathroom, separate kitchen and another double bedroom. 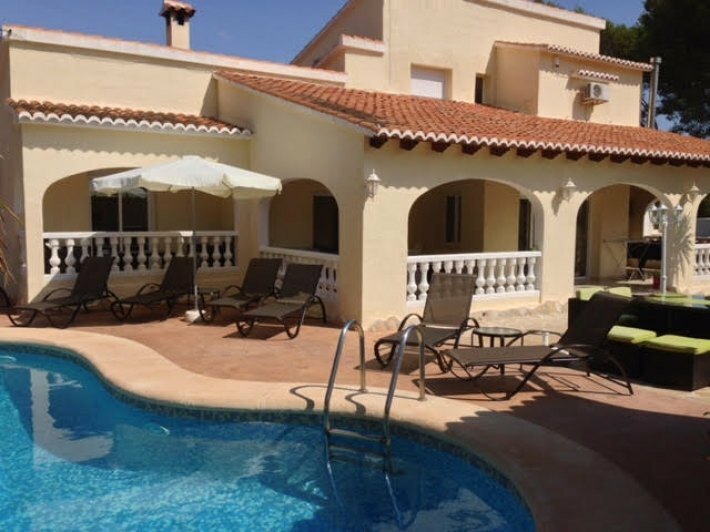 This guest apartment is internally connected to the big double garage which could partially be used to extend the accomodation if required.The property boasts gas central heating, double glazing, airconditioning hot and cold, private pool, jacuzzi and panoramic sea/mountain views. Five bed villa for sale Moraira Five bed villa for sale Moraira. Villa for sale finished to a very high standard and within walking distance to Moraira, the beach and all amenities. The villa is on two levels with an internal staircase. There is a large games room, office and parking for three cars. The villa has been very tastefully finished. There is a nice pool and summer kitchen leading off the lounge. Here to can take nice open views and enjoy the Spanish climate. Down stairs there is a large games room and office. The location makes it an ideal villa for all occasions. Area Guide Moraira is a small coastal fishing village. Full of charm and tranquillity. Two beautiful sandy beaches. Impressive marina. Conveniently located between Alicante and Valencia airports. Wonderful place to live with all year round sunshine. Average temperature is 20 degrees centigrade with 325 days of sunshine. Moraira is very popular with visitors from all over Europe. The micro climate and beauty of the area is hard to beat. Full of English charm. Close by are other pretty towns, along the coast or inland. The country side is stunning with vineyards, almond and orange trees. The village boasts many top quality restaurants and charming shops to explore. Value for money is amazing. Fabulous area for sporting facilities. All water sports, tennis, paddle tennis, football, golf, cycling, horse riding, walking and climbing. There are many walking clubs with fantastic walks. A great way to find out about the area and take in the views. Moraira has villas and apartments for sale. Good schools in the area, both local and international plus excellent health care facilities. Fantastic place for holidays or for permanent living. Click here to view pictures of the local beaches. Please contact us if you have any question on property. The area or just general questions regarding Moraira and living in Spain. Villa for sale with sea and golf views Villa for sale with sea and golf views. The villa with a view! This beautiful front line villa for sale has the most amazing views across the Ifach Golf Course and then out towards the Mediterranean Ocean, a truly stunning view. The dining room is in a way that one is drawn to appreciate the outlook just imagine dining there every night! The villa itself is grand in size and has three insuite bedrooms, the master having a Jacuzzi bath and separate shower. There is another room which could be utilised as a cinema room or gym, or could easily be converted into two further bedrooms. Additionally, there is a self contained one bedroom flat for staff or guests. The villa comes complete with air conditioning, central heating, alarm system and is partly furnished. By the pool area there is a BBQ and bar area. There is a garage and plenty of off road parking. 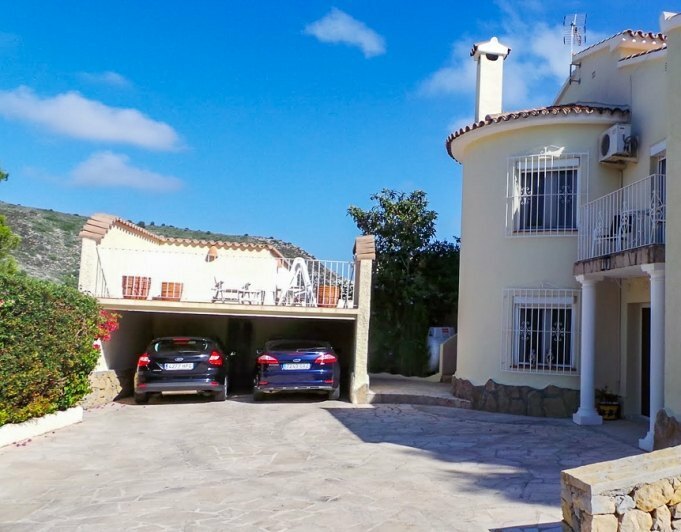 Set in a very desirable area of Moraira and within walking distance of shops, restaurants etc, this villa is a must see for those seeking stunning sea views. Area Guide Moraira is a small coastal fishing village. Full of charm and tranquillity. Two beautiful sandy beaches. Impressive marina. Conveniently located between Alicante and Valencia airports. Wonderful place to live with all year round sunshine. Average temperature is 20 degrees centigrade with 325 days of sunshine. Moraira is very popular with visitors from all over Europe. The micro climate and beauty of the area is hard to beat. Full of English charm. Close by are other pretty towns, along the coast or inland. The country side is stunning with vineyards, almond and orange trees. The village boasts many top quality restaurants and charming shops to explore. Value for money is amazing. Click here to view pictures of the local beaches. Please contact us if you have any question on property. The area or just general questions regarding Moraira and living in Spain. 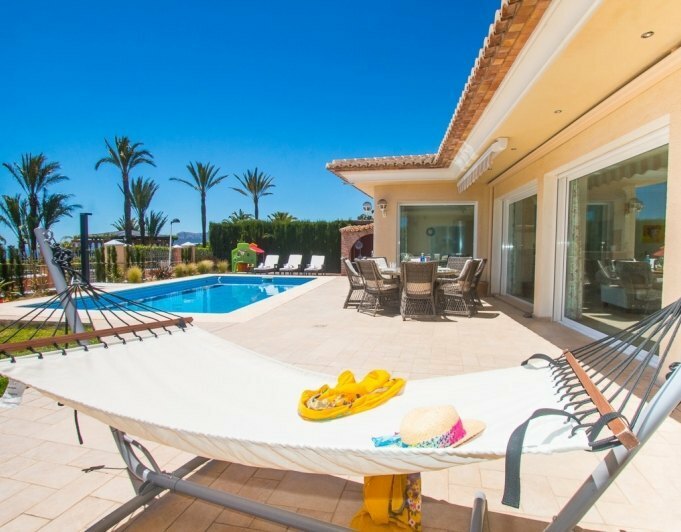 This is a delightful three bedroomed villa located in the sought after area of La Cometa. Set on a flat plot and distributed over one single level making this an ideal holiday or full time home in Spain. Access to the property is via electronic gates which leads through to off street parking and also a side gate by the pool, just a short walk away from the beach. As you enter the driveway you find the principal entrance to the property which gives way to a large bright lounge area with air conditioning and access to the fantastic outside dining area and terrace. To the right of the entrance is the dining area, the open plan kitchen and also a utility room. Leading off the lounge is access to the three bedrooms. One being the master bedroom with an ensuite bathroom with access to the terrace and pool area. The second is a double bedroom with bathroom just across the hall. And the third is also a double bedroom with the bathroom being just next to it. All the bedrooms have built in wardrobes and air conditioning. The villa also boasts underfloor heating throughout. The garden is a well maintained and very peaceful area with a large pool and lovely open views. 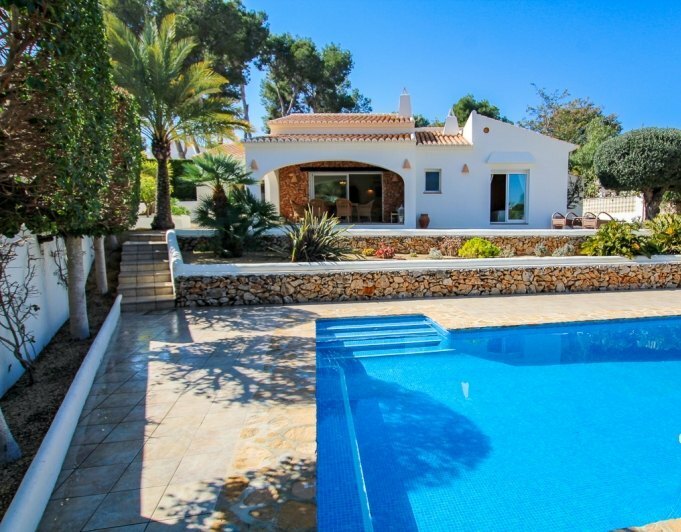 This is a fantastic property built to a very high standard by Villas Buigues.